Despite being illegal under federal law nationwide, marijuana businesses in states like Colorado, Washington, and Oregon are growing rapidly. With varying degrees of state licensing, where does that leave growers and sellers criminally? Just because certain state governments are not enforcing drug laws doesn’t mean the federal government won’t. Adding to this confusion, the marijuana industry is attracting lawyers willing to help clients navigate criminal codes and regulatory bodies in what is still a crime under federal law. Doesn’t that mean these lawyers are breaking the law and the oaths they swore to their respective state bars? If you’ve ever wondered about these issues, you are not alone. Moderated by Above The Law Editor Staci Zaretsky and hosted at Legal Talk Network headquarters, this Q&A podcasting event feature experts like Hilary Bricken from Harris Moure’s Canna Law Group, Tom Downey from Ireland Stapleton, Professor Sam Kamin from University of Denver Sturm College of Law, and Brian Ruden, who owns Starbuds, Tree of Wellness, and Altermeds. Staci Zaretsky became an editor for Above the Law in June 2011. Her writing has appeared in other legal publications, such as Judgepedia, Lawyerist, and Ms. JD. She has been featured on various television and radio programs, including CNBC’s Power Lunch, CBS Radio News, BBC Radio, CLTV Chicago, HuffPost Live, TF1 TV France, Chicago Public Radio, and Civil Discourse Now. Tom Downey is a director and attorney at Ireland Stapleton Pryor & Pascoe, PC, where he represents primarily liquor and marijuana businesses. Prior to that he led Denver’s Department of Excise and Licenses where he redrafted Denver’s policies and procedures for liquor licensing and wrote the original policies and procedures for Denver’s recreational marijuana licenses. Professor Sam Kamin is the Vicente Sederberg Professor of Marijuana Law and Policy at University of Denver’s Sturm College of Law where he teaches ‘Representing the Marijuana Law Client’. His areas of research include criminal procedure, death penalty jurisprudence, federal courts, and constitutional remedies. Brian Ruden is an attorney who owns three dispensaries in Colorado called Starbuds, Tree of Wellness, and Altermeds. He has spent many years researching growing techniques and testing strains to deliver high quality medical and recreational marijuana products. Prior to entering the marijuana business in 2010, Brian was a litigator turned tax resolution expert. Notify me when there’s a new episode! 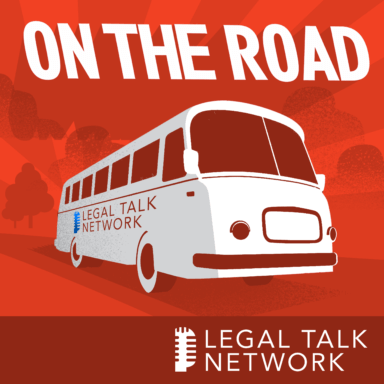 Recorded on the conference floor, "On the Road" includes highlights and interviews from popular legal events. Matthew Hall talks about the impending issues relating to Brexit and GDPR. Jess Birken and Gyi Tsakalakis talk about how to master Google Adwords for your law firm. Betsy Ziegler talks about her keynote addressing how advancements in technology will shape the legal industry in years to come. Brett Burney and Jeffrey Richardson talk about their top tips for lawyers on iOS, apps, and gear. Basha Rubin and Emily Wajert talk about classification issues for gig economy employers and how laws are changing.